A drop of Santo Cuviso on the tongue and you’ll understand that true alchemists know how to quench the soul. Each barrel of bacanora is handcrafted from 100% Agave Angustifolio piñas, harvested in Sierra de Sonora, México, and distilled by Master Bacanorero, Manuel “El Toro” Chacón, whose process infuses every drop with the sacred magic of three generations. 100% organic. 100% wild. 100% sinfully good. That’s how the Jesuit missionaries referred to it back in the summer of 1756 when the Ópata Indians offered it up as a healing remedy. It didn’t take long for the Jesuits to praise the benefits of a daily dose. Legend has it that they broke their bread with it religiously, certain that each and every agave plant is a gift from God. The irony, of course, is that the Jesuit missionaries arrived in Sonora hoping to save Indian souls, but it was their souls that were saved, sip by sip. 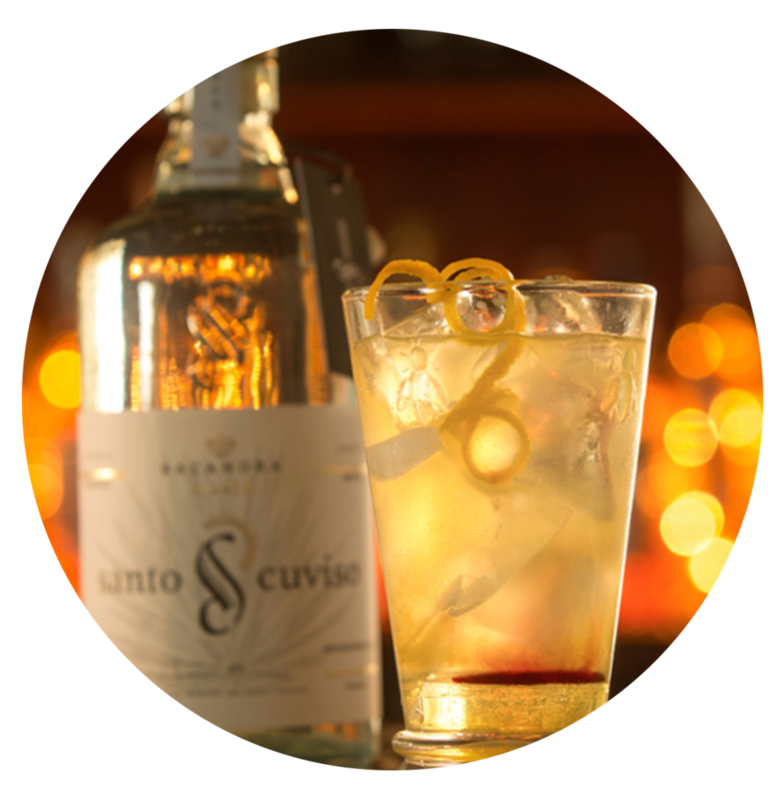 We’re certain the minute you taste Santo Cuvisio, you’ll feel the same saving grace. The hands of our Master Bacanorero, Manuel “El Toro” Chacón, embrace so much more than just a family recipe. 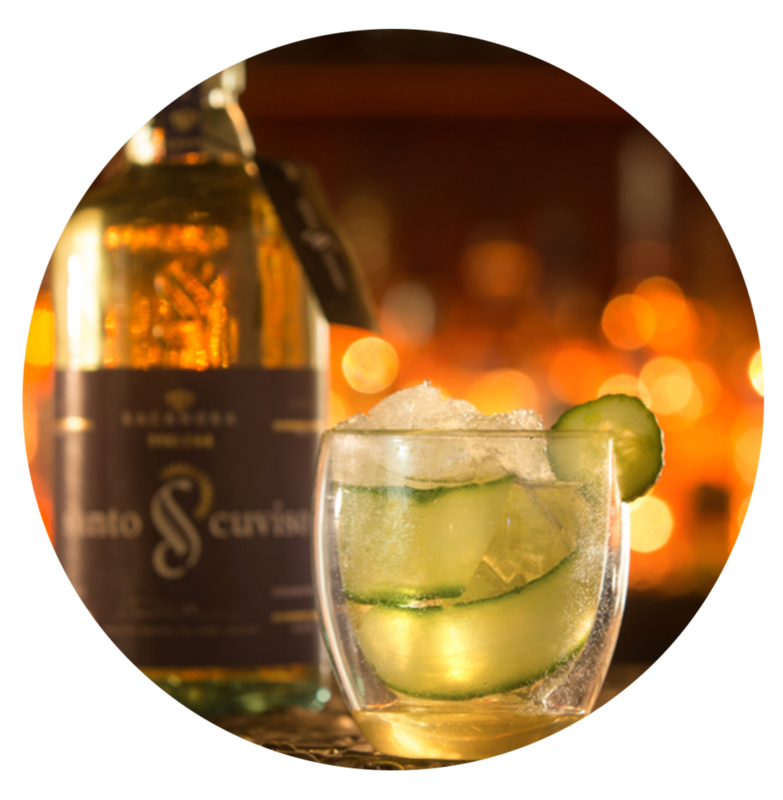 They hold the legacy of three generations who risked their lives to distill and deliver their passion for the spirit of Santo Cuviso. Bacanora production was banned for 77 years in Sonora, México, and those who were caught distilling agave were hanged or imprisoned…but the Chacón family persevered and when the ban lifted in 1992 everyone knew why—Santo Cuviso holds the power to turn saints into sinners. Transforming agave piñas (hearts) into Santo Cuviso is a sacred science. Manuel and his team harvest the wild agave, then clean and roast the piñas over mesquite and oak in an underground volcanic stone oven for days. Then they crush every heart, grinding them down to their pure essence and extracting the juices that remain. The juices are poured into vats to ferment and then, once purified, double-distilled in handcrafted copper alambiques. The result? Something you simply can’t get enough of. Santo Cuviso translates as holy bacanora. It’s dry, complex, with a kick of pepper and a grounded, earthy finish. Crafted to remind you that sometimes the best way to refresh your soul is to allow your lips to kiss a little spirit every day. Taste: Dry, complex, slightly smoky, naturally sweet with a kick of pepper and an earthy finish. The subtle wonder of BLANCO, infused with Uvalama Berries which adds a delightfully aromatic and fruity finish along with the shimmer of sun. This bacanora is prepared using traditional agave concentrate, with an addition of a whisper of star anise, just 2% of this essence adds its enticing notes to the classic recipe. Santo Cuviso is wildly spirited from the inside out. Our once a year artist edition, drawn by Kathleen Cammarata, depicts The Patron Saint of No Turning Back, she’ll be watching over you from the moment you take that first sip. Cammarata’s paintings and drawings examine the place and terrain of an imaginary world subject to growth, change, explosion, and rebirth. Her work teams with life of the strangest variety presenting nature as dynamic ambiguous characters. This label is part of Kathleen’s series of Erased Saints- a collection of 16 pencil drawings that challenge the traditional perspective of female patron saints. Each drawing begs the question, “Who decides what is holy and what is not.” Kathleen is an American artist born in NY, now living and working in San Miguel. She has been painting for over 30 years and in the last decade pursued drawing as a formal contemporary medium. She has had 25 solo shows and participated in over 50 juried shows throughout New England and the USA. She has received numerous grants and awards for her work. 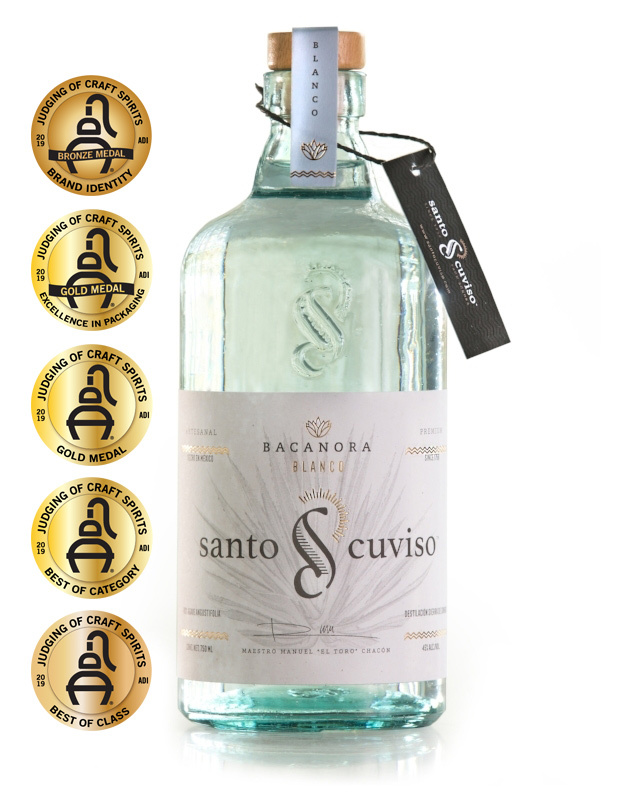 2018 Limited Edition of 25 Bottles of Bacanora "Santo Cuviso Blanco", numbered and signed labels are available through the website only. Included is a limited 17x22 inch Giclée print, numbered and signed. Contact us for availability. A portion of the sale will go to Patronato Pro Niños. Since 1970, this non-profit organization has provided medical and dental services to children in San Miguel de Allende whose families cannot afford them. 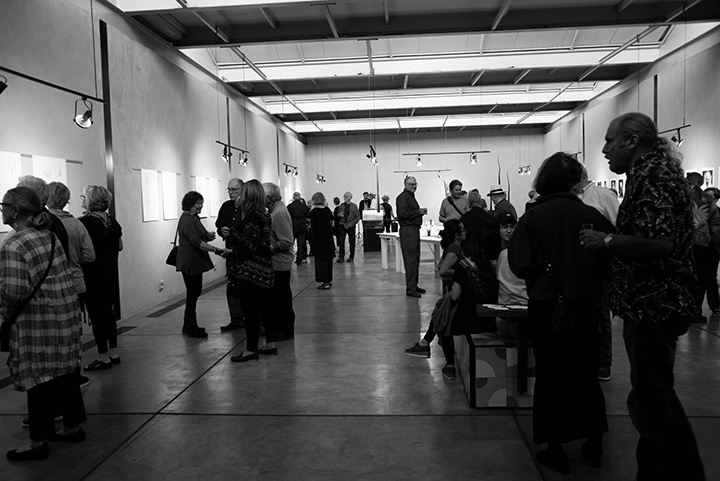 Introduction of Bacanora Santo Cuviso on October 29, 2018 at the “Garage", the art space of DosCasas in San Miguel de Alllende. A drop of Santo Cuviso on the tongue and you’ll understand that true alchemists know how to quench the soul. The name of the Bacanora is historically connected with the town of the same name, even though it was not exactly the place where it was born. The production of this drink is an ancient activity of Sonora, however, As a result of 80 years of illegality of the activity, its production technology has not undergone major changes. This drink has more than 300 years being elaborated in an artisanal way, passing its secret of elaboration from generation to generation. It should be noted that on November 6, 2000, the "General Declaration of Protection of the BACANORA Denomination of Origin" was published in the Official Gazette of the Federation, officially stating that 35 municipalities of the State of Sonora are the only entities that they recognize themselves as producers of this drink. The Official Standard for the development of bacanora (NOM-168-SCFI-2004), the Agave angustifolia Haw. It is the only variety of agave allowed in the elaboration of this drink, as long as it is cultivated and processed in the area of he Denomination of Origin. Because this plant has been used by the inhabitants of the sierra in the production of bacanora, the wild populations of this one are threatened, since the minimum sizes for its exploitation are not respected, added to that there is no regulation for the use of these resources. Agave angustifolia owes its name to the word in Latin: "Angusti" which means narrow and it is because its leaves are long and narrow. Some of the common names throughout Mexico are: Maguey Espadín, Maguey de Mezcal, Maguey Mezcalero, Maguey San Martinero, Maguey de Espadilla, Dob-Yee. It is the agave of which more common names have been registered and this is due to its wide distribution in Mexican territory. It is the most widely cultivated species of Agave in Oaxaca and many other states of the Mexican Pacific basin, for the production of mezcal. Their quiotes are used for construction, their flowers are edible and historically their leaves have been used in the extraction of ixtle, likewise it is used as a medicine.